You are currently browsing the Pontiac Paradise Shop Talk weblog archives for September, 2012. Finally! A photo of where to mount your 63 factory Tach! 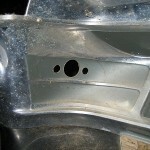 Thanks to Josh for the much needed photo of where to mount your 63 factory tach.